A 1987 video game by the Spanish developer Opera soft. A for its time amazingly well done action/exploration/puzzle platform game, based on the idea that Stanley searched the jungles for the famous explorer. The player must explore the jungle, using various weapons and items to advance further, to reach Dr. Livingstone. 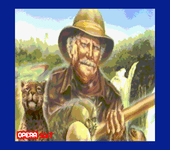 The game was seemingly published by Opera Soft themselves in Spain, and by Alligata for all other versions in Europe. Release date info mainly fetched from over the net, please help confirm.